This one is for us! This has been an epic project and last week it was finished! As always, with a big quilt project, it feels like it has been a long and colourful and exhilarating journey and once it is done, you feel a little bereft. It is worse when the quilt is for someone else, but let's be clear - THIS ONE IS NOT GOING ANYWHERE - it is for me and my gorgeous new Chaise Long (Christmas pressie from my Sweetheart!) and my books. What could be more wonderful than languishing on this, under this with a good read on a chilly winter Sunday afternoon?! The trouble with trying to start up a small business based around your hobby, is that you can loose the joy of making things for your own home and so I decided that I should set myself the target of having one project a year that is just for us. It has it's beginnings in Houston, Texas early in 2015. I was visiting my dear friend Sylvi of www.SewColorful.com. We were 'trailing wives' together in Paris a few years ago and lived close to each other in a western suburb of the city. Sylvi taught me how to quilt and has been an inspiration to me ever since. I remember very clearly the first lesson - I was a total novice and I saw the rotary cutter and mat and a pile of fabrics and I was completely hooked from the outset. Despite us both being moved around - us to Stockholm and Sylvi to Houston, we have remained friends and I have been lucky enough to visit her a few times. 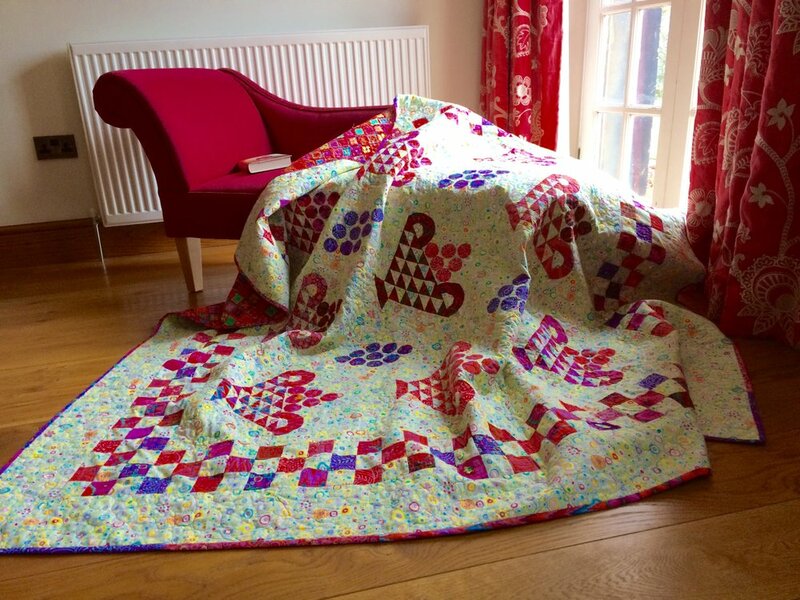 Sylvi's passion is Kaffe Fassett fabric and her house is full of the dreamiest quilts EVER. I was very enamoured with this particular quilt and it was from then on...at the top of my list. It is a pattern called 'Bekah's Baskets' by KF and is featured in his 'Country Garden Quilts' book. The original is actually much larger than my version with an additional border and has a darker background fabric. I chose my fabric in Sylvi's online shop...which is totally amazing - stacked floor to ceiling with delicious Kaffe Fassett fabric. Check it out here if you want to see more here. I was slow to start the quilt...I had other things going on and it was only when I started really organising my sewing room that I decided that it was just no good having this amazing project just sitting in a drawer. I set to work on it. It has been a lovely project to have bubbling along in the background and I have picked it up and put it down a thousand times. It is pieced and hand appliquéd and I loved this combination. I used the freezer paper technique for the cherries and it was easy and effective. I think the key to good appliqué is being accurate with your pressing and using silk thread to hand stitch the shapes down. 'On point' quilts can be frustrating - the block edges get distorted and stretched and somehow they seem much harder to make than when the blocks simply fall into rows. Spray starch helps enormously with this and I used alot of it. Once the main body of the quilt was done, the checker board border was a joy to add and gave the quilt a real sense of itself, putting it's feel, firmly in the early 19th Century for me. I could see at this point that it was going to be big enough, so I just put another band of 'Roman Glass' fabric on to finish. The backing is one of my favourite more modern KF fabrics and blends everything together brilliantly, bridging the idea of the past and present. The quilting was a bit more of a challenge. By the time I have done all the piecing and appliqué, I usually feel excited to quilt projects, but this one had me worried. It seemed that I had the potential to ruin it. After consulting with Sylvi, I went ahead with a variegated thread by Cotton Patch. It was an unusual choice for me and the trouble with free motion quilting is that once you have started on a course, you pretty much have to stick with it because it is such a pain in the .... to unpick. I stitched an all over 'stippling' pattern on a medium scale over the main part of the quilt. It looked ok, but I wasn't enamoured. The back was fine because the fabric was so bold that it hardly showed really. For the Checker board pattern I decided to switch to red aurafil thread and do a more modern square pattern in the red blocks only. This went well and I liked it, but now on the final border and I got in a bit of mess. I decided on a pebbling effect, but having done about 10" wasn't very sure. I tried unpicking...never again... and had to accept to stick with it. I finished the quilting and was a bit grumpy about it. I left it for a day or so and then put on the scrappy binding I had waiting. It looked immediately better. Then I got the big ironing board out and pressed the whole thing - somehow, it was like magic. The quilting stitches sunk into the fabric and looked smooth and polished and completely at home. The whole thing amazed me...it looked just beautiful. I was so happy, I cannot tell you. PS. This Chaise is a very special present. Straight out of my little embroidered picture. Pattern and Kits available in my Etsy Shop.